Imagine a world where the battery in your phone charges wirelessly via over the air signals. Back in 2017, we told you that Disney was working on this technology. So is a company called Ossia. The latter today announced (via Gizmodo) that it is teaming up with smartphone case maker Spigen to produce a smartphone battery case that will work with Ossia's technology. The Spigen Forever Sleeve case is a proof of concept and is on display at the Las Vegas Convention Center during CES. 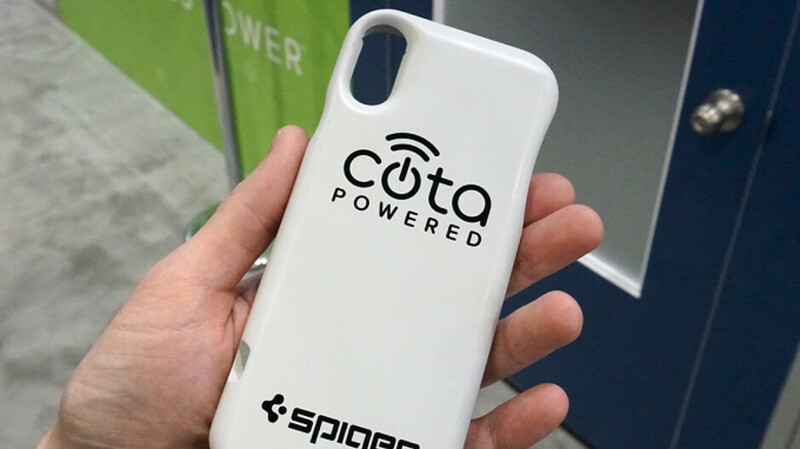 With Ossia's Cota wireless technology, once the battery inside a phone is dead, the one inside the case will take over the task of powering the device. This battery will charge without the use of any cords, pads or plugs even if it is meters away from the transmitter, and out of the line-of-sight. Even if the smartphone user is walking, as long as he is in the range of the 5.8GHz signals, the lithium ion battery inside the case will charge. Both companies hope to bring the case to market by next year. Last year their transmitter was 10w. Not sure if that's changed. At 6 feet away it drops to 1w or less which will barely charge your phone. More likely just slow the discharge. Someone else can use their family to test the safety and put up with the nothingburger results for charging. I'll wait. the inefficiency of it is just not worth the trouble.. with fast charge and even fast "inductive" charge its kind of a waste.... how about focusing on some solid state batteries!!!!!!!! Terrible technology in its current state. Not only is it terrible for the environment but the charging speed is low and useless. This thing needs awful lot of energy in order just to send out a tiny bit of it. Marketing scam and nothing more. This doesn't live up to the hope of the title. First you need a network of safe emitters, then you need to be very close to them, then you need to have this case. I dread to think of the safety issues and energy usage /waste. It will need BLE to negotiate switch on, and focused beam delivery of the power. And somehow you'll need to pay for it all, so a sign in process and micro payment system. I'll not hold my breath.